The traditional wisdom is that light-volume holiday sessions, such as the sessions approaching on Wednesday and Friday, are bullish. Since 1941, Black Friday (the day after Thanksgiving) has seen an average rise of 0.28%, and a positive close 70% of the time. Yesterday, I also mentioned that the day before Thanksgiving has been a green session in 8 of the prior 9 years. There's a reason for this, and it has nothing to do with good holiday cheer. The simple fact is, the big hedge funds and commercials recognize that they can't dump huge quantities of inventory into a thinly-traded market, because the retail investors (i.e.- the suckers) aren't doing enough buying to support it. It would tank the market in a big way if there were heavy selling on these light volume days, which would mean they'd have to settle for even lower prices on their inventory on Monday. Their reasoning is to let it go up, then sell into strength when there's more volume. In the past nine years, the only year in which Pre-Thanksgiving Wednesday closed lower was 2007; which was not long after the start of the previous bear market. Tomorrow, we might get a tiny clue about just how desperate the big players are. If the market sees higher selling than usual during tomorrow's "traditionally green" session, it could lead to a large red candle on the charts. 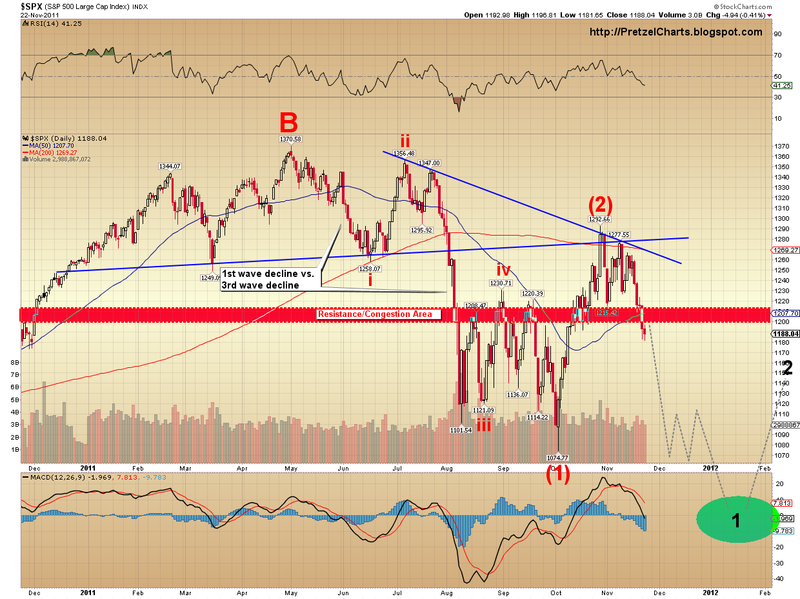 But really, any close lower will be a confirmation of the market's underlying weakness. Thanksgiving week is historically one of the best weeks of the entire year for the markets; if it's a bad week this year, then that's relevant information. Another fun fact: the Monday following Thanksgiving has been a negative day in 7 of the 9 past years. So even during the bull runs, the big players have been in distribution mode immediately after the light holiday sessions. If my preferred count is correct, we are now at the very beginning of Minor (3) down. In Elliott Theory, each impulse wave is made up of five smaller waves, so more specifically, we are in wave 1-down of Minor (3) down. And if my big picture count is correct, then this market is different than anything most of us have traded before. Under that count, we are in the midst of a third wave decline at Supercycle degree (alternately, we are in the midst of a Grand Supercycle third wave down, which would be even more powerful). This bear market is, in fact, an ongoing continuation of the 2007-2009 bear market; the entire rally from the March '09 lows was merely a large counter-trend correction, the B-Wave of the ongoing bear. 2007-09 was the A wave (a first wave), and this is the C-wave (a third wave). Anyway, to give you an idea of the difference between the power of a first and third wave, look at the chart below. The question I keep asking myself is: should iii of (1) (prior waterfall) be more powerful than 1 of (3) (current waterfall)? You'll also note the congestion zone of prior support. Theoretically, this zone should now be overhead resistance. Now, all that said, we are still not into the "meat" of Minor (3) down -- as you can see from the black "1" on the chart, we are only in the first sub-wave of Minor (3). And all of this, of course, assumes my long term count is correct. 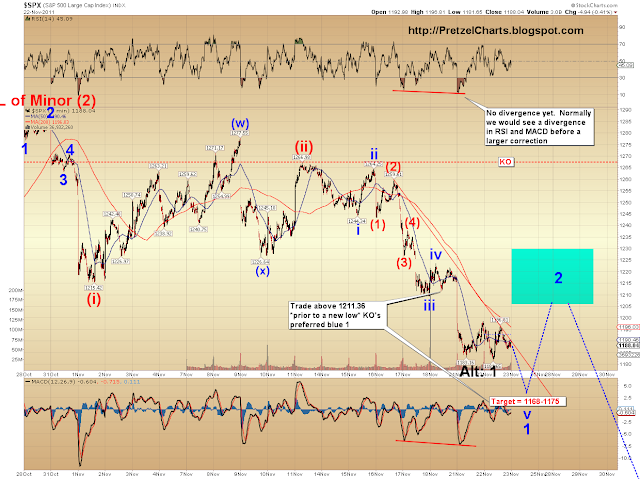 When this wave approaches bottom, I will again rigorously challenge my assumptions in that regard. We lose the ability to navigate the market properly if we become too headstrong in our ideas of what "should" happen. Thus far, the market continues to behave in accordance with my early November prediction of a waterfall decline. I have continued to try to narrow down the very short-term possibilities, so far with a good level of success. In a material sense, not much has really changed since yesterday. Just to reiterate for new readers, my expecations are for this wave (wave 1-down of Minor (3) down) to carry the SPX into the 1000-1050 zone, although preliminary projections could stretch all the way down to the 800's. I'll narrow that down when we get closer, but that's my preferred medium term view. In the ongoing effort to try and uncover the path we might take to reach the medium term targets, the two very short term options I presented yesterday are still in effect today. The first (below) is the count I've been favoring over the short term since this leg of the decline began. It's a bearish nest of 1's and 2's and indicates that the market has yet to see the strongest wave of the decline; it also suggests that significant rallies will be few and far between. Under this count, the preliminary target for blue wave (iii) would be the 1150 area. The blue (ii) can be knocked out if the SPX declines to 1175 or lower, then rallies back above the blue (ii) high. If that happens, the count shown in the second chart becomes far more likely, and we may see a day or two of rally. I am now favoring the count above at 58% odds, up a little from yesterday. I would love to tell my readers exactly why I'm favoring this, but in order to do so, I would be forced to reveal my Proprietary Indicator of Potential Secrets (or PIPS for short -- I considered multiple letter combinations here, but then added in "Potential" to keep the acronym "family friendly"). Obviously, I can't reveal it, or else everyone would have one... and then I'd never be able to sell it to Goldman Sachs for so much money that I'll routinely be able to leave Cadillacs as tips. But even PIPS isn't infallible, so a second short term possibility is outlined below. The second possibility is the one being favored by most Elliott Wave analysts, since it's the safe and traditional way to look at things. It's certainly possible for this to be playing out; and statistically, it would seem like one of these times I go out on a limb with my preferred view, I'm bound to be wrong. This view has the market making a short-term bottom in the 1168-1175 area, then bouncing up toward the blue target box. This would also fit the usual seasonality better, so maybe I'm an idiot to even suggest otherwise (and that thought has crossed my mind on a number of occasions). I'm giving this count 42% odds, so it's clearly possible, and there's certainly nothing definitive in the SPX chart to suggest it couldn't play out this way. My preferred medium term view remains that Wave 1-down of Minor (3) down is now in process, however do remain aware of the bullish alternate count at this juncture. We are now entering territory where that alternate count could conceivably form a bottom, if my preferred count is wrong. I am keeping my odds at 15% for that count, as it simply doesn't fit well with everything I've been analyzing for the past month, but it's not impossible. The decline so far is three waves -- so from a technical standpoint, it could either be the preferred count as outlined, with the fourth and fifth wave still to come, or it could be an ABC correction for the bullish alternate. Unfortunately, there's simply no way to know with complete certainty at this point. This alternate would bottom soon and then rally up to new highs in the 1300's. As I said, I consider this bullish alternate to be highly unlikely -- but the market does have a mind of its own. Trade safe. Well, ^THAT'S^ a confidence builder, lol. Nice trade on the miner! Morning, Eur at 1.3386 down almost 1%! Do you think if we break 1168 then we'll head down around 1150 before moving higher? Given that I'm already long spy puts (thanks to you), trying to figure out whether to add more or not. I saw you mentioned in yesterday's thread about stop 'ins' and chasing declines during '08. I"m trying to take your advice and consider if I was in all cash for the year up to today, what would I do here? Maximum frustration for longs and those wanting to get short would be down today, Friday and Monday...My current thinking is to risk some short-term pain in order to maximize medium-term gain. But I'm biased because I didn't have you in '08 :). I managed to hedge well enough to not lose any money, but didn't make any either. I'm determined (to a fault) to not let that happen this time. I'm an adult and accept responsibility for my decisions, not looking for trading advice, just curious on stop-in level if one wasn't short coming in to today. Well, one difference is I trade futures, so the bid/ask spreads are tiny, and I'm not at the mercy of the VIX. It's a lot harder to use that strategy with puts. In fact, I'd say it's almost impossible. Have you considered hedging w/ short futures contracts? You still get a ton of leverage there at $50 per point per contract. Plus you can trade overnight markets, plus you don't have the VIX "x" factor impacting your trades, plus you can jump in and out quick. If we break 1168, I would consider 1150 pretty likely. But I don't think I personally would try the "stop in" tactic w/ puts. You'd get creamed on a strong reversal because of the VIX factor. You almost always have to buy strength to get decent put pricing. I guess that would be slightly better if you're trading ATM puts, but still, VIX is such a trade killer if it goes against you. Yeah, been watching. If they can't rally the Euro quick, I'll be quite amazed if the Euro recovers here. That was a big technical breakdown. The other way to count the dollar is 1-2 1-2, etc. That would lead to a screaming dollar rally at some point here. The day's young though, Bully could come a' callin'. Thanks. In process of opening a futures trading account, but it's not funded yet...I agree, implied vols popping on every decline is another factor. I actually was a MM on CBOE a long time ago. But if you're right, and I know you are, vols are going to pop a lot more when this wave is in full force. And that's when I'll sell (vix @ 70). Thanks for confirming short-term level to watch. Eur has gone from 1.3376 to 1.34 in last hour, definitely getting a technical bounce, will be interesting to see if it holds. FRANKFURT (MarketWatch) -- An auction of German government bonds technically failed Wednesday, underlining fears that Europe's long-running sovereign debt crisis now threatens the core of the euro zone." Sorry for being MIA for the last few hours! Lemme respond to your earlier comments in your prev article. First thing, sorry about the confusion about Disqus! It was just one bizarre instance where the page loaded and the comments area had reverted back to the old format, so I thought maybe Disqus had revealed yet another glitch that resulted in its dismissal. NVM!!! Yeah, about the cash on the sidelines argument, thank you SO MUCH for your explanation. I've never bought into that (how could I? I follow this blog! ), but I've been hearing people talk about it day in day out lately and it's driving me nuts! yet I was not able to provide a proper intellectual counterargument about why they're wrong. Your explanation couldn't be clearer. I'm just a newbie trying to learn something new everyday, hoping to become a great trader one day. Challenging common assumptions about the market (which is prob the reason why >90% of retail investors lose money) is one of the ways I love to do. It just seems that everything is getting debunked, which is cool. Not much to give Bully hope today, that's for sure. He's got: seasonality. Bears got everything else, lol. But, yeah, that's a common argument you hear from marginal analysts. I seriously can't tell you how many times I heard/read about it in '08. "Cash on the sidelines gonna ride in any minute now!" I'm amazed none of them have learned yet. Technically, they couldn't find enough people to buy their bonds. So it's OK....? "Technically, they couldn't find enough people to buy their bonds. So it's OK....?" Great update, Pretz. The counts seem to be so much easier to follow and progressing as *expected* now that that 'triangle / pennant' (or whatever it was) is behind us. Wow, it looks like a bull slaughter brewing (again) today. William and POTUS, thank for the additional updates and info. Dave's post made me laugh, too. Top end of the target range for the 42% probability count was just reached, btw. Nice to see the down day today. I have been following your posts every day for a couple of weeks and I want to thank you for keeping me short the market! One important question: can you estimate the dates for when the various waves will take place? It would be very helpful for knowing which options months to have positions in. Thanks, and count on me as a subscriber if you ever start charging for your services (within a reasonable price limit!). Shout-out to Mav for his second donation! Thanks Mav. How might that play out? A push down during the first 30 mins or so to encourage a bunch of shorts on the back of today's poor news (China), then sharp reversal to trap them all - nice "diabolical" outcome - and everyone else gets to enjoy their turkey that bit more. I do not post much. Jut want to wish you and your family a Great Thanksgiving. You are truly amazing. God Bless You. Good morning. I was about to say the same thing about the VIX ... it's barely budging despite this morning's sell-off. Seems like a bull market in complacency. PL, many thanks for this morning's update. A great Thanksgiving to you and your family. Dan, I have found that trying to attach dates to things often does more harm than good. The "cycle-type dates" you hear so often are usually meaningless, unless they predict magnitude, and few of them do -- in other words, is the low a one-day low, two-day low, 6 month low, 10 year low? For example, suppose I told you that yesterday was a cycle high. What does that mean? A one day high? A 3 month high? How could you trade with that info in any way? So, IMO, price is by far and away the most important, and really, the *only* indicator that has real value. I can make rough estimations based on the wave postions, but corrective waves can stretch out much longer than you would expect and throw those estimations off. So if I'm playing options, I just have to look for the bottom based on the price pattern, and close out at that point. Third waves (like now) are really the best waves to play options, because they move fast and your premium doesn't dissolve. What I would recommend to the options players in the crowd, btw, is to close out those positions *before* we reach the bottom of 1 of (3). Close 'em out when we hit (iv) of 1 of 3 -- cause those fourth waves can drag. Should be nice and fat by the time we get to (iv), if this wave keeps moving the way it has. That's not trading advice, of course. Just hypothetical. Happy Thanksgiving to everyone, and many thanks for your continued support! Where's Rocky? He's our resident VXX expert. Hrm we just bounced off that 1168 region. What invalidates the alternate bear count? Sorry, mav, misread your question. No price point -- just waveform. This market is gapping down even as it tries to rally...Not healthy at all. You guys seeing what I meant about the "ratcheting" action from the article the other day? Makes it tough to enter the market. lol. market might put in one of those little sideways/up deals like yesterday before we do. dont we have to enter (vi) and (v) before we get to wave 2? I thought we were still in 1? 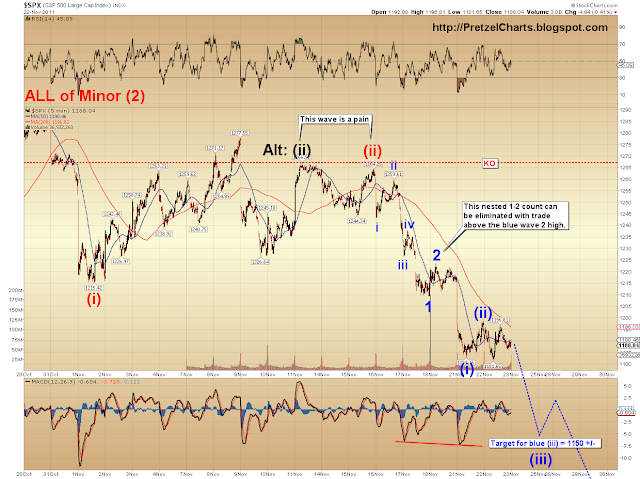 In my preferred count (see middle chart) wave 1 is OVER, so's 2. We're in the midst of wave 3 right now, with a ways to go yet. We's workin' it. Nothing but rock bottom share prices for me. C'm on! you can do better! No, no, no, NEVER put your finger in that part of the doggie! Pretzel, I wouldn't have had the guts to stay short past 1215...your analysis has kept me making money the past few days so I decided to throw a small donation your way. Sorry it isn't larger, I'm in capital rebuild mode after the beating I took August - October. Hopefully I'll be in a better position in the near future to compensate you better for your work here. Thanks man. missed it, nothing done, not chasing. Good morning everyone. I decided to sleep in a little during this holiday season. I just woke up and found this world a merciless place! Happy Tanksgiving. Call me impatient (or early), but I've covered shorts here so I can focus on what's really important over the holiday weekend. It's been a nice run, we're approaching (or maybe in) PL's target zone for this wave, and I'm thinking, "bulls make money, bears make money, pigs get slaughtered." For those staying short, consider my buys-to-cover to be the virgins thrown into the volcano that will enable the market to go lower. A blessed Thanksgiving to all! Question Pretzel: I remembered VIX went all the way up the 90s in Oct 08. If the magnitude of this supercycle wave C correct plays out, what would be the potential of VIX? So far the VIX is pretty complacent and no where near the top of its bollinger band and does not seem to indicate a huge reversal any time soon. So, tell me again, why did I cover yesterday? Anybody? On second thought, don't answer that. Oh well, here's to hoping we get a Thanksgiving bounce this afternoon or Friday so I can get back in. You called it again Pretzel - excellent work. Enjoy the holiday. Frank, VIX probably won't best the '08 highs until we're in a similar wave, i.e.- 3 of (3), instead of 1 of (3). Startling amount of complacency though, considering. Probably won't start to spike 'til we close in on 1100, given what we're seeing so far. Everybody still banking on that Santa rally, maybe? To answer your question, no, I don't foresee a Santa rally, as I've been saying all month. The 2 in my alt. count would last maybe a day or three. I think we'll probably tank pretty hard straight into December, with a few minor bounces along the way. Next minor bounce I'm looking for will probably come in the 1150-1155 zone. Pretz, sorry it did bother me, but it shouldn't have as you said. I just like to objective straight tech-talk. I am going all long put on this sucka... hehehe. Thanks to you I am starting the options trading and I like it :-) Long puts have little risk and huge reward compared to shorts, IMHO. Loving it. And loving the crash too! And that came out of the mouth of a bull.... lmao. Just wondering what will happen (to the world) once we're down at '08 levels and below. And wondering; are "we" the only once seeing this. That can't be. Com'on the big boys gotta see this too; and I wonder what their reasoning of playing this "rinse and repeat" cycle is. Money obviously, but when the world economies completely tank, what do they get out of it? I started following you on Minyanville a couple of weeks ago. I was also bearish and you helped me stay the course. I decided to try to find your blog and was happy (thrilled) to find that all your info is available at no charge. You provide an excellent service and I'm sure most people wouldn't mind paying some sort of fee -- I certainly wouldn't. Just curious what part of the world you're writing from as you seem to be looking to get some sleep after the market opens. Thanks again for your tremendous work. Most of the big boys got our during Ben's QE1/QE2 "market amnesty." And if this is the big one, they don't get anything out of it. Some of those firms will be lucky to even survive. Pretz, awesome post, thank you. maybe you will consider commenting for us noobs about being right the overall trend but in the wrong trading vehicles i.e. vix related etfs, for now anyway,been in short side since Friday but have not made any headway, actually threading a little water.will hold on though. I think we need a new "Reactions" button. "good post! "....just doesn't cut it. How about " Remarkably Astute, or Holy Crap Batman, Pretzel's a genius. Regarding hours, I live in Maui, so the market opens at 4:30 a.m. here. Logistics problems I have beyond that: I try to spend some time with my family during the day, particularly in the afternoon when the kids are home, then I end up charting and writing literally all night (as well as during the day when I can), so I'm usually just getting done about the time the market opens. It's brutal, and my wife and I have talked about moving back to the mainland, 'cause these hours are going to kill me. When I look at the SP and the ND I totally see EW but then when I turn to CL I am thinking that we are on a parallel course except back a few waves. Maybe I am missing something, but it looks to me like the bad is still to come while in SP we are in the bad with the worst still to come. I just want to make sure that I am not missing something. Eww, I would stay away from things tied to VIX unless you really know what you're doing. Personally, I like the futures. Other than occasional spec puts, that's about all I trade. The double/triple inverse funds can be okay, but they're not "buy and hold" as they rebalance daily and go down much faster than they go up when the market reverses. There's always the option to just short the SPY or DIA or QQQ as a "baby step." With margin, you can get a reasonable rate of return, and those are probably the "safest" for learning. Thanks for the donation, Marc, much appreciated! And, also, thanks for the donation, Heberto! I need to do a solid breakdown on crude this weekend. There might be a way to play it to make a killing, if I'm seeing it right. I just haven't had time to really sit down w/ it lately. Let me get back to you on it over the next few days. Yeah, I got it in my email, and was like WTF is he talking about? Had to go hunt you down, lol. Euro might make it back to the 1.34 area, but should turn lower from there. If the Euro can't get back above 1.35 pretty soon, it could head as low as 1.10-1.15. These waveforms are a bit weird. We might be in for something like we saw on the 21st in SPX. you think we finished of (v) Pretzel? I don't *think* so, but it's not impossible. Watch the trendchannel in the chart I posted earlier for clues. If we break out, then it might be time for a little rally. As long as that channel holds, though, there hasn't been any indication of a trend change. My gut says we'll still need to go lower, but maybe we do a sideways/up grind like the 21st and yesterday into the half session on Friday, then head lower again on Monday. So do you still think we hit 1150 b4 a bounce, and that when the bounce comes it will only be around 15 points & the crash continues? Alright guys, it's that time of day (8:40 a.m.) when I need to get to sleep. 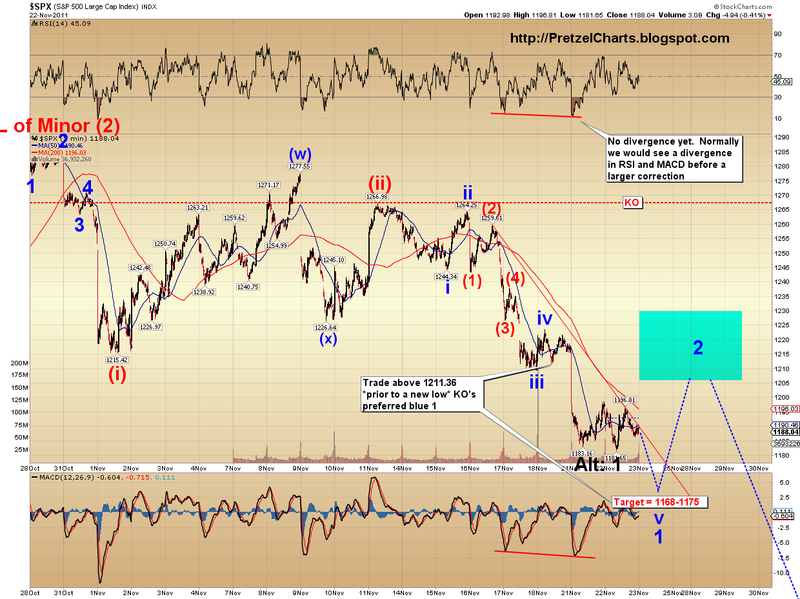 SPX might have just completed an ABC off the lows -- see if we can knock out the LOD. GL! PL, I'm stoked to make a donation today...been following for a few weeks now. I found you and the gang about when i thought things were going south (and when a buddy was saying sh*t like "im gonna sell my LULU when it gets back to 60). Today I covered PCLN, GOOG, and sold off a chunk of TZA and FAZ, all of which worked beautifully....aloha from Honolulu, I'm up at 4:30 sometimes too! alright...done with the VXX until next week. a diversified short & hold portfolio? lol, 2 months ago I would never have thought my portfolio would look like this. Still have some cash if we pop on friday...at that point, i'll be all in. any favorites out there?...or any of my picks above that anyone feels are probably a bad idea? definitely looking for feedback from the community. I know pretzel has been cleaning up with PCLN thus far, I'm assuming he feels that move is not finished yet. Check out CVI. H&S pattern just breached. bought puts in MCD, will add if we pop at 1150.
hello all, I am new here, been follwoing teh blog for a few weeks and have been absolutely amazed at how insightful (and acurate) PL's analysis has been. Kudos!!!! My question though is about the ECB and/or the U.S. Fed and the implications for when some sort of QE is announced. I agree that anything either does will only put off the inevitable, but I am leary about being short at teh time of such announcement(s)/ It would seem painfully obvious that teh ECB especially has no choice but to announce something firly soon. So, how do you trade with such an overhang? It would seem that at given moment your gains being short will be wiped out. Thoughts? Sounds good to me. I would add SINA to the short and hold portfolio. Because of relatively low volume on the down days (compared to August down days), VIX hasn't really responded to the SPX fall. When the real waterfall with high volume starts is when VIX is going to spike. Thats when everyone joins the selling party and creates that insane volatility spike. Right now, its just people from the Pretzel blog trying to position themselves discretely for the big setup, careful to not trigger the volatility spike ;). Would love to hear PL's thoughts on VIX. Thanks PL for the great work! RT, I like your arsenal there, lol. I follow a few of those...I'm not sure AMZN will fall (out of it's uptrend). LULU looks prime for a meltdown but "they are still growing"...it could be a stock that buy and holds hold. Are options predicting PCLN to fall through 450? MCD looks like a good short. I really would love to short CMG...i mean, I never heard of a $300 burrito stock. 48x trailing earnings is outrageous...I may put that one on friday. MCD's dividend scares me a bit, people love that stock and I see people buying those dips. I do not understand the fixation with QE3. QE1 & 2 was supposed to stimulate the economy and not temporarily support the stock market. It failed in what it had been supposed to achieve so why would it even be concidered again. Insanity is when you do the same thing over and over again, yet expecting a different result?! I see 25% of my Richemont shorts also hit my target for a 20% ROI. Will probably lighten up a little more tomorrow and Friday while today's action set us up nicely for a down day or two while you guys devour some turkey and market finds its way down to 1150! Happy Thanksgiving to all you Yankees! Guys I hope you've been supporting the blog by either donating money or something something else (theres lots of pretty links on the site). Support Pretz, he's really deserved it. Yep, planning to donate once I get my paycheck lol. Hi, everyone, been afk all day, doin' the family "thang." william, for his 2nd donation... thanks very much, william -- you da man! Dinesh, for his 2nd donation as well... thanks, Dinesh, much appreciated! and Jaco for his donation -- thanks, Jaco! Sorry to hear about your run-in with Bully. No run-in with Bully Pretz. I would not bet against the USD at the moment. Problem is all my money is in real Rands (ZAR) and none in Dollars (USD). It doesn't completely rule it out. It's a bit complicated, but I'll cover it in the update. This is a challenging structure, because there's been no clear internal third wave. Usually, that's how you triangulate the count. As for the ECB, they *can't* print, the treaty forbids it. So they're not even an issue really, at least in that regard. Of course, that's not trading advice, just for educational purposes. My theory is that they pretty much knew QE wasn't gonna do a hill of beans for the economy. I call it "market anmesty" -- it was a "last chance, get-out-of-jail-free" card for investors. CVI is an ugly one. That sucka could make a fast trip down to $6. ty HT. I think I'll cover VIX in my next article, actually. I have some interesting observations to relay. The flipside to that is a ton of folks here, like me, who really appreciate you sharing your hard work. Thanks. Okay, how friggin cool is that. I just added a three real-time quote streams, including Forex, and an interactive real-time chart app where you can enter in whatever symbol you want. Now I'll be able to watch the tape when I'm typing, and check on Euro dollar without even leaving the page. Pretty sweet! Speaking of, the Your Ho did make it back up to 1.34 a bit earlier, as I suggested yesterday. If bears can hold the 1.35 pivot, then it's bombs away. hi! PL. Happy Thanksgiving. Can you throw some light on market action for the next seven days? I know its asking too much but given the shorts (first timer) I am carrying it' s jittery out there with talks of QE and the EuroPress (the Sarkel combo is definitely up to something..hmm). Your alt counts seem to suggest a mild rally given SPX takes out 1150-1155, the ES took a bounce from the 1160s level, is this not good for the shorts in the very short term? Thanks again. A lot may depend on what the Euro does while the stock market sleeps over Thanksgiving. ES seems to be on its "no basis in reality" track right now, which it often does at times like this. 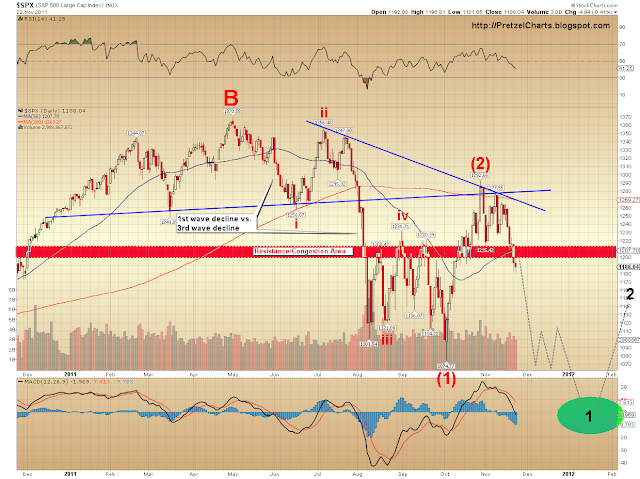 Should equalize into something normalish by the time the markets open on Friday. I'll have more detail in the update for Friday. Just really needing a break from working right now, so I'm messing with fun stuff, like the website. Anyway seeing the market literally through rose-coloured spectacles, I decided to make use of the sucker rally and go short the market in SASOL, banking on a declining oil price. I for one am thankful for this blog and for PL. When I close out some of my profitable trades I will show my gratitude, PL. Happy Thanksgiving. Thank you for everything! You are an amazing teacher, a wonderful person, and a truly remarkable analyst who has mastered EW theory and its application. I am awed! You have a feel for this, a sense of intuition backed up by knowledge, and a sense of practicality, and more than anyone else a boldness based on confidence. I love it. You are not afraid to be right, or wrong and to present an alternative that is always possible. Your simplistic and detailed explanations are easy to understand and digest. You are an exceptional teacher. I am so happy and thrilled to have stumbled upon you. Well said and ditto to everything. Thanks for being you, Pretzel. My Thanksgiving wishes to you and everyone who frequents here, Pretz. Hope you get some rest today, and will look forward to when you are 'back at it tomorrow'. I don't pretend to know what's going to happen next with the market's direction and movements, but with bear sentiment and bad news at a clear crescendo, I keep expecting some sort ST reversal to scare johnny come lately shorts out of their freshly taken positions. I *suspected* the possibility of an ST reversal two days ago, but the bad news has kept coming since then. Your counts have been spot on. And I've been 'overthinking' what the market will do. one man's crash is another man's slightly down day... the last crash for me was the flash crash SPX down ~100 pts in one day. Is that your definition of a crash? or do you have a different magnitude in mind? Very well written Dinesh. If Pretz ever needs one of those testimonial type plugs for an ad, he could do a lot worse than this lovely piece of yours! Took the words right out of my mouth. :-D Happy Thanksgiving to all!!! Dinesh, thanks for taking the time to post these kind words -- and for the donations. Brian, Happy Thanksgiving to you too! I do want to add to my post a few minutes ago, and just thank all of you for adding not only to the quality of the site -- and for the donations, of course -- but also for adding considerably to my own enjoyment of it all. Without all of you, this wouldn't be nearly as rewarding for me on an emotional level (and of course, on a more tangible level, when we're talking about donations!). And I learn from all of you, as well. Each of you adds something unique to the discussion, whether the topic is the market or something else, based on your personal experiences. You folks are really the ones who make this site a great place. To use an analogy: I may be providing the theater, but what good is an empty theater? You are the hearts and souls who make that theater come alive with laughter, memories, and good cheer. Once you get used to it, I think you'll probably find that you don't want to go back to trading much else. Years ago, when I first started trading futures, I was a little "scared" of them -- but now I couldn't imagine trading without 'em. Other than some spec OTM puts here and there (simply because nothing beats the absolute *killing* you can make when you nail those), I hardly trade anything else. Looks like you got a good entry, too, based on where the market sits now. Yeah, if I can figure out a way to do that, I will, believe me. Turkey time, so I'll bbl. Keeping a close eye on the Euro here. Need to see this pattern transmute into something other than this bullish falling wedge (see attached chart). Thanks, Dance (this is how I always want to pronounce your name, lol -- that or "Dancy"), you too! Happy Thanksgiving Pretzel. Thanks for your hard work and dedication to keep this site educational and entertaining at the same time. Happy Thanksgiving, Frank -- and thanks! I've been watching that same type of thing in the Aussie $. It is now through the lower end of it. Not sure if that has any meaning. Are you seeing any divergence on the MACD? I didn't see that on the chart. I have many things to be thankful for & you are one of them! Euro just broke down out of the wedge... IF that's not an ending diagonal throw-over -- in other words, if bears can push it a bit, we could see it drop like a rock really soon. Bears gotta keep pushing here, though. ES just broke through 1150. Bears are pushing alright. Euro prolly gonna try to backtest 1.33 -- bears need to hold it down or we'll have a bullish whipsaw and ES will rally. This is pretty much the whole ballgame right here. If that back-test holds, Euro's in deep doo-doo. Conversely, if Euro can make that breakdown into a whipsaw, index bears could have real trouble over the short term.